If you’re looking to take your edamame game UP a notch try making this simple Spicy Edamame Recipe. I know everyone and their dog serves it cold, with salt. And that is certainly tasty BUT warm with a few simple ingredients takes it from good to star of the appetizer show. 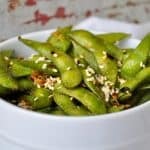 Seriously you have to try it this Spicy Edamame Recipe at home to believe how amazing edamame can really be. Last week I was in Sacramento for IFBC, the International Food Bloggers Conference and I has some wonderful experiences. Obviously, we ate and drank our way through the city, evening hitting the Mid Town Farmers Market.  That was a blast, there was so much fresh produce! Of course, restaurants were our mainstay in Sacramento. A couple of stand outs for me: Elderflower and Jalapeno Margarita at Zocalo, drinks at the Jungle Bird, sushi and appetizers at Mikuni and coffee from Old Soul. A couple of the places we went were just meh as well, you can’t win them all, right? One of the first things I wanted to make when I got home was MORE of the spicy, succulent edamame from Mikuni. It’s served warm, which is NOT what I was expecting, tossed with spicy oil. Now I SHOULD have asked what was in it but I’d had a drink at that point so I wasn’t thinking clearly. I think it had garlic, ginger, red pepper of some sort, and other assorted flavors. 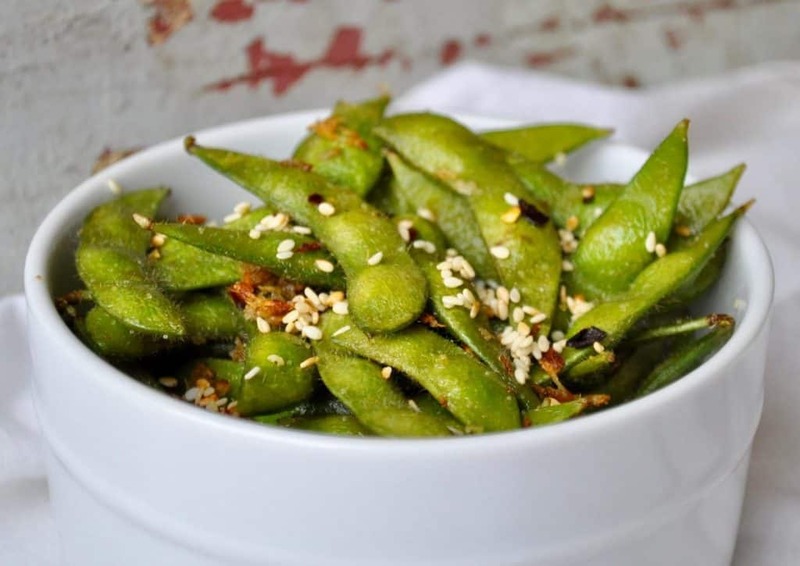 This recipe for Spicy Edamame is NOT exactly what we ate but it’s so good I had to share it. Obvious,ly add more red pepper flakes as desired for heat and feel free to adjust the salt to your preference. If you're looking to take your edamame game UP a notch try making this simple Spicy Edamame Recipe, served warm and richly spiced it will become a family favorite. I’m going to keep trying to recreate the edamame from Mikuni but I wonder how that will actually work? Because the farther I get from it, and the more recipes I test/taste the more the my memory will fade. I think I might try some miso paste, or soy sauce, and sriracha next time I give this recipe testing a whirl. For now I’ll enjoy this Spicy Edamame Recipe as much as possible. 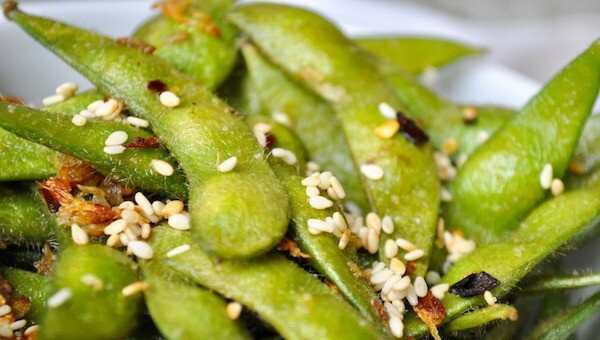 I love edamame and this sounds so yummy with all the spicyness! !